Americans continue to express patience with the pace of U.N. weapons inspections and want United Nations backing for any military action against Iraq. But that is not the approach they believe the Bush Administration is taking. Americans would approve of U.S. military action to remove Iraqi dictator Saddam Hussein from power, but by 48% to 27%, they say their concern is making sure that Iraq is disarmed. They are willing to give the U.N. more time to build a consensus around how to do that. But most believe that President Bush sees things very differently -- 54% say he is more interested in ousting Saddam Hussein, and just 20% think his goal is to disarm Hussein. Even though less than half think enough evidence has been presented to justify an attack now, most believe the President has already decided to launch a military strike. The public is divided on whether the Bush Administration has yet presented enough evidence against Iraq to justify military action right now. 47% say they have, 44% say they still have not. HAS BUSH ADMINISTRATION MADE THE CASE FOR WAR NOW? Almost all Americans are following the crisis. 50% say they are monitoring it very closely, with another 41% saying they are watching it somewhat closely -- and in both groups only about half say the Administration has put forth enough evidence. But while U.N. chief weapons inspector Hans Blix prepares to deliver another report on Iraq this week and the Security Council discusses a new resolution, most Americans think none of that may matter with regard to the question of war. Most believe the Administration has already decided to launch a military strike. HAS BUSH ADMINISTRATION ALREADY DECIDED TO TAKE MILITARY ACTION? Americans remain split on whether Iraq poses an immediate threat. 43% say that while they believe Iraq is indeed a threat to U.S. interests, it is one that can be contained for now. Roughly the same number, 45%, say it is a threat that requires immediate military action. Americans are willing to wait for the support of the international community before taking military action. The public's desire to secure U.N. approval for action remains strong, and has slipped only slightly in the last few days. SHOULD U.S. WAIT FOR UNITED NATIONS APPROVAL? The public also urges patience with the inspections process, as it has for months: 60% say give the inspectors more time right now. However, this appears to have more to do with building international support than a belief in the efficacy of weapons inspections. Americans do not believe those inspections have induced any real cooperation yet from Saddam Hussein: 78% think that the Iraqi leader is not cooperating with the U.N. inspectors, and just 10% say he is. IS SADDAM COOPERATING WITH INSPECTORS? Not only do most Americans want to wait for U.N. authorization, most also continue to believe the U.S. should take its allies' views into account on the Iraq question. There are, however, signs of increasing frustration. Just last week, 70% of Americans said that the U.S. should take allies' views into account before taking action, rather than simply doing whatever it thinks is right with regard to Iraq. This week, after several public statements of disagreement by allies opposed to the U.S. position, a majority of Americans still supports this viewpoint -- but that percentage has slipped to 56%. Not all the allies may join a possible war. When Americans are asked if they would approve of military action if the U.S. were joined by Great Britain but not -- as may be the case -- by France and Russia, 53% say they would approve of action under such circumstances, and 42% say they would not. While they have some misgivings about the timing, Americans continue to support the general idea of using military action to remove Saddam Hussein: 69% approve, a figure that has largely held steady throughout the standoff. 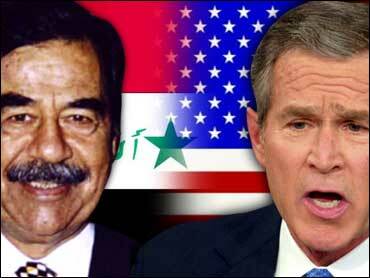 MILITARY ACTION TO REMOVE SADDAM? But the public's desire to have international support and more inspections come first may stem, in part, from concerns about the consequences of war. When asked whether a possible war with Iraq would be fairly quick or result in a lengthy involvement, half of Americans say they think the U.S. could end up fighting for quite a while. Of those who think involvement will be long, over three-quarters want to wait for the U.N. before entering into a conflict. A majority of those who expect a war would be quick and successful thinks the U.S. should act immediately, even without international backing. Support for military action drops when Americans are asked if removing the dictator is worth the potential costs in American life. 52% say it is; 38% say it is not. 60% also think that a conflict with Iraq is likely to lead to a wider war in the region, involving other Arab nations and Israel. One-third do not believe it is a likely outcome. WOULD U.S.–IRAQ CONFLICT LEAD TO WIDER MIDEAST WAR? Despite the recent capture of suspected top Al Qaeda leader Khalid Shaikh Mohammed, Americans' views on the progress of the war on terror have changed only slightly from mid-February. Many remain concerned over the possible ramifications of a U.S.-Iraq war. A majority -- 55% -- believes that if the U.S. goes to war with Iraq, the threat of terrorism against Americans will increase. In generally assessing the terror threat, 75% of the public thinks that it is at least somewhat likely that there will be another attack in the U.S. within in the next few months. While still a high figure, this is lower than its level of 80% in mid-February, just after the threat level was raised to orange. IS ANOTHER TERROR ATTACK LIKELY SOON? Just prior to the 1991 Persian Gulf war, 73% thought a terrorist attack against the United States was at least somewhat likely. Overall, the public's view of President Bush's handling of the Iraq standoff remains steady, with a majority -- 54% -- approving and 39% disapproving. The President's approval rating for the Iraq crisis is slightly higher than the 51% who approve of his general handling of foreign policy. Both ratings are far higher than for his handling of the economy, where just 41% approve. Overall, the President's job approval stands at 58%. It had been as low as 54% in mid-February, but was 56% last week and now is continuing to inch higher. This poll was conducted among a nationwide random sample of 723 adults, interviewed by telephone March 4-5, 2003. The error due to sampling for results based on the entire sample could be plus or minus four percentage points. Sampling error for subgroups may be higher.